Thanks to Jane for recommending this film to me! 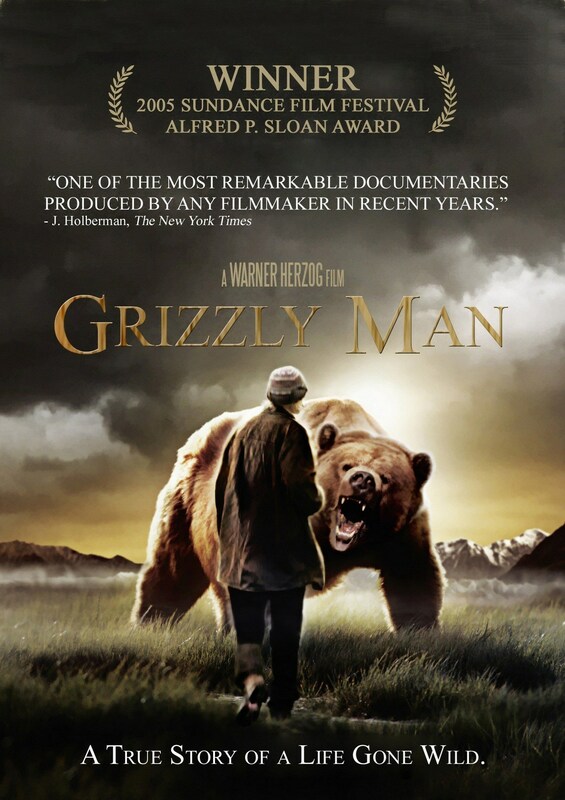 Brief Synopsis – Documentary about the life and death of a famed Grizzly Bear conservationist who was tragically killed by the animals he was studying and protecting. My Take on it – Jane is an amazing judge of Documentaries and I had a feeling that I’d like this one, but I had no idea as to how much I would love this film. I’ve personally seen a nice amount of documentaries and this is ranked among the best because of the way that Director Werner Herzog chose to tell the story. There are really no surprises here as to what happened to Timothy Treadwell during his 13th summer among the bears and we are told within the first few minutes about the attack. When you listen to Tim speak, you think two things simultaneously; either this man is a genius or a complete moron. The truth is that he is neither, but circumstances that led to his tragic death can be mapped out over the years based on the footage that he himself filmed about his life out in the wild. We learn so much about him from the footage and by the end, we clearly understand why he has chosen to do all that he does and his motivation for it all. The footage shown also tells us such a fascinating story about who he was behind and in front of the camera and many of those shots are ones that are nearly impossible to capture. Herzog does a great job reconstructing everything and presents us with a full portrait of how he lived his life never concerned for himself but rather more concerned for the safety and protection of the bears of the wild. Bottom Line – What an amazing portrait of a man who could be considered either a genius or a complete moron. We really learn a lot about his life and motivations and begin to understand what drives a man to do what he did. Great footage both behind the scenes and in front of the camera that are almost impossible to capture on film. Highly Recommended! This sounds very good. Slipped past me. Will give it a go. Thanks Rob! cant wait to hear ur thoughts vic! Great doc. Totally agree with your Oscar Worthy rating, Rob. With Herzog, you never know what to expect. This was a challenging one. I love our bear loving hero. We’re all animals, so a connection across species may not seem so special, but it felt that way. He risked his life for that special relationship. I understand the idiot comments, but I felt for this couple. They spread invaluable awareness. Sure, you play with fire and you can get burned, but we each weigh the risk differently. Was this special access to nature worth a life? I think the Grizzly Man would say yes. Thanks for reminding me about this amazing doc and highlighting it for a new audience. very true dan. his quote on letterman (which was removed from the film says so much). i’d love to one day watch that whole interview. Jane gets all the credit, I never heard of this beforehand. I like how Herzog will mess with the viewer. Like including fictional scenes into documentaries to blur the lines of entertainment and truth. One of my fav recent ones was The Cave of Forgotten Dreams (I may have title wrong). It’s just one to wonder with.